So there’s opposition to in-development movies about the life of Martin Luther King, Jr. 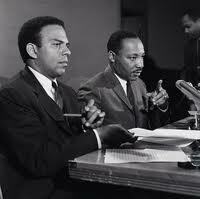 The distinguished civil-rights activist and King confidant Andrew Young (pictured with King), and others, objected to the treatment of King in a script to have been directed by Paul “Bourne” Greengrass. The script portrays King’s infidelities, among other things. Young says he doesn’t object if a biopic shows a few warts on its subject, but…there was a lot more than that. Of course there was! But when biopics canonize subjects, audiences tend to turn away. Who wants a plaster saint? King’s Attitude About Jews: Backlash?